This Persistence Market Research (PMR) report examines the ‘Global ADHD Therapeutics Market for the period 2015-2024. The primary objective of the report is to offer updates and information related to opportunities in the Global ADHD Therapeutics Market. ADHD is a neurobehavioral disorder among children with symptoms of hyperactivity, inattention, and impulsivity. ADHD is a sustained pattern of inattention and/or impulsivity/hyperactivity, which hampers proper functioning of a child’s brain and development. ADHD begins during childhood, and thus is termed neurodevelopmental disorder even if it is undiagnosed until adulthood. When the degree of inattention and hyperactivity in a child is inconsistent with the child’s current developmental level, the child is classified as an ADHD patient. Rising in the prevalence of ADHD disorder, availability of multiple treatment options and ADHD drugs specific to age groups, is expected to bolster growth of the ADHD therapeutics market in the near future. Also, increasing awareness regarding ADHD, shift from ICD-10 to DSM-IV and product innovation is expected to drive growth of ADHD therapeutics market during the forecast period. This report covers the global ADHD therapeutics market performance in terms of revenue contribution from various segments. This section also includes PMR analysis of key trends, drivers, restraints and opportunities, which are influencing growth of the global ADHD therapeutics market. Impact analysis of key growth drivers and restraints are included in this report to better equip clients with crystal clear decision-making insights. The ADHD therapeutics market report begins with an overview of the ADHD and why are the patients worldwide adopting the medication. This section also underlines factors influencing growth of the ADHD therapeutics market along with detailing of the key trends, drivers, restraints, opportunity and regulations. Impact analysis of key regional growth drivers and restraints based on the weighted average model along with key region-specific trends is included in report to better equip clients with information and hidden insights. At the end of the report, PMR has provided key strategic recommendation for both existing and new players in the market to emerge sustainably profitable. The global ADHD therapeutics market is segmented on the basis of drug type into stimulants (Amphetamine, Methylphenidate, Dextroamphetamine, Dexmethylphenidate, and Lisdexamfetamine Dimesylate) and non-stimulants (Atomoxetine, Bupropion, Guanfacine and Clonidine). Based on age group, the market has been segmented into pediatric and adolescent and adults. Based on distribution channel, the market has been segmented into specialty clinics, hospital pharmacies, retail pharmacies and e-Commerce. A detailed analysis has been provided for every segment and sub-segment in terms of market size, Y-o-Y growth rate, absolute $ opportunity, market attractive index, and BPS analysis. In terms of drugs type, stimulants are expected to emerge as the drugs of choice, both among physicians and patients worldwide. Amphetamine is also expected to gain popularity over the forecast period. The next section of the report highlights the growth trends of the global ADHD therapeutics market by region. It provides a market outlook for 2015–2024 and sets the forecast within the context of the ADHD therapeutics market. The study discusses key regional trends contributing to growth of the ADHD therapeutics market worldwide, as well as analysis of the extent to which drivers are influencing this market in each region. Key regions assessed in this report include North America, Latin America, Europe, Asia Pacific and MEA. North America region is expected to emerge dominant and remain the most attractive market over the forecast period. The above sections – by drug type, by age group, by distribution channel and by region – evaluate the present scenario and growth prospects of the ADHD therapeutics market for the period 2015 –2024. We have considered 2015 as the base year and provided data for the forecast period. Detailed company profiles include company-specific long-term and short-term strategies, key offerings and recent developments in the ADHD therapeutics market. Key competitors covered in terms of manufacturers include Eli Lilly and Company, Novartis AG, Shire PLC, Pfizer, Inc., GlaxoSmithKline PLC, Mallinckrodt Pharmaceuticals, Hisamitsu Pharmaceutical Co., Inc., Impax Laboratories, Inc., Johnson & Johnson, UCB S.A., and Purdue Parma L.P. In the final section of the report, ADHD Therapeutics ‘Strategic Recommendation’ is included to provide insights for companies to strengthen footprint and position themselves in the global ADHD therapeutics market. ADHD is a brain/neurodevelopmental/neurobehavioral disorder characterized by pervasive and impairing symptoms of inattention, hyperactivity, and impulsivity. The Centers for Disease Control and Prevention (CDC) defines “neurobehavioral” as the way the brain affects emotion, behavior, and learning. Growth in the ADHD therapeutics market is mainly driven by granular impact of changing lifestyles and value systems impacting quality of births, increasing use of additives and preservations in children’s diet, rising prevalence of ADHD among children in the 4–17 year age group, increasing adoption of diagnostic guidelines (statistical manual of mental disorders) with low threshold for diagnosis of ADHD in other regions such as Europe and Latin America. 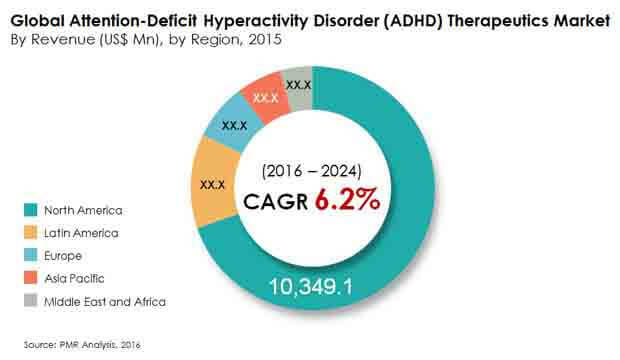 Moreover, increasing awareness regarding ADHD among physicians and patients, and opinion-based diagnosis of ADHD owing to lack of standard diagnostic tests is expected to boost revenue growth of the global ADHD therapeutics market in the near future. However, existence of comorbid conditions in children leads to underdiagnoses of ADHD and less availability of non-stimulants ADHD drugs in various geographies. These are factors expected to restrain growth of the market over the forecast period. In terms of value, the global ADHD therapeutics market was valued at US$ 14 Bn in 2014, and is expected to increase to US$ 25 Bn by 2024 end, at a CAGR of 6.2% during the forecast period. Based on drug type, the market has been segmented into stimulants and non-stimulants. Stimulants segment is further sub-segmented into Amphetamine, Methylphenidate, Dextroamphetamine, Dexmethylphenidate, and Lisdexamfetamine Dimesylate. Non-stimulants segment is further sub-segmented into Atomoxetine, Bupropion, Guanfacine, and Clonidine. Lisdexamfetamine Dimesylate segment is projected to be the fastest growing sub-segment in the stimulants segment over the forecast period, owing to patent protection and high price of the drug. Of the total stimulants, Lisdexamfetamine Dimesylate segment is expected to account for 13.4 % revenue share in 2016, which is expected to increase significantly over the forecast period. On the basis of age group, the market has been segmented into pediatric and adolescent, and adults. The adults age group segment accounted for highest revenue share of 50.4% in 2015, and is expected to retain its dominance throughout the forecast period. On the basis of distribution channel, the market has been segmented into Specialty Clinics, Hospital Pharmacies, Retail Pharmacies, and e-Commerce. Retail pharmacies is the most preferred medium of drug distribution, and this segment accounted for highest revenue share of 44% in 2015, and is expected to retain its dominance throughout the forecast period. The global ADHD therapeutics market has been segmented into five major regions namely North America, Latin America, Europe, Asia Pacific, and the Middle East & Africa. In terms of value, North America dominated the global market with 68.2% revenue share of the overall ADHD therapeutics market in 2015. Europe and Asia Pacific are estimated to be the fastest growing emerging markets over the forecast period. Currently, stimulants drugs are a major revenue contributor in most regions. Rising prevalence of ADHD across the globe owing to low threshold of diagnostic criteria is expected to fuel revenue growth of global ADHD therapeutics market over the forecast period. Japan ADHD therapeutics market is expected to register a CAGR of 6.6 % from 2016 to 2024. Prevalence of ADHD among children in Japan was 7.7 %. in 2007 and around 87.8 % of children diagnosed with ADHD in Japan showed co-morbid conditions; whereas in China, prevalence of ADHD among children in the age group of 7–10 years was 6.3%. Some key players covered in the global ADHD therapeutics drug market report include Eli Lilly and Company, Novartis AG, Shire PLC, Pfizer, Inc., GlaxoSmithKline PLC, Mallinckrodt Pharmaceuticals, Hisamitsu Pharmaceutical Co., Inc., Impax Laboratories, Inc., Johnson & Johnson, UCB S.A., and Purdue Parma L.P. The report is enriched through identification of company-specific strategies related to drug development, market consolidation initiatives, and analysis of the various market player’s specific strengths, weaknesses, opportunities, and threats.